First, let me apologize for being MIA last week, we were in Missouri for a funeral, so I didn’t have the time to do any posting. Second, if you caught any of the pictures I posted on my Facebook page, you can remotely guess what an AMAZING time I had in Austin. You will probably get tired of hearing me rave about Austin, so just deal with it. When you go crunchy, it’s a blessing to have a crunchy Mecca close to you! We did so much that weekend, that I decided I’ll break up our trip by days, that way you can see where we went and more importantly what we ate. I was overwhelmed at how many places had garden beds out front and supported local farmers. My hope is that there is a shift in restaurants reaching out to surrounding farms, so we know exactly where our food comes from and what’s in it. I know it’s a pipe dream but it will keep my hope alive. As soon as we got in town, we dropped our bags off at the Airbnb that Casey had chosen for us (a first for both), and headed for the door. It was a drizzly day, well weekend for that matter, but we were determined to NOT let that slow us down! When your world revolves around gluten-free, grain-free food, you will brave the elements no matter what. 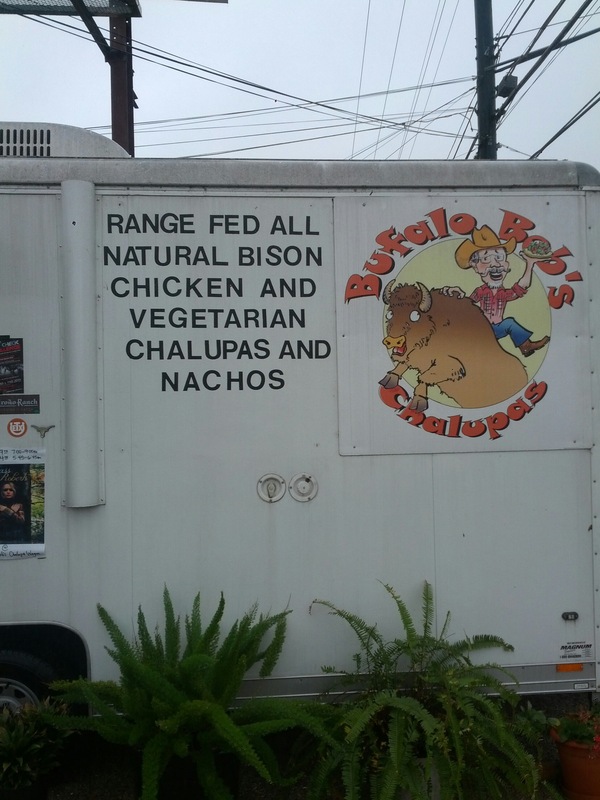 The first place we stuffed our face at was Bufalo Bob’s Chalupa Wagon (that’s not a typo) on 1st Street. It was tough to find in the rain, but man I’m glad we did! Bob and I talked for about 20 minutes about pesticides, GMOs, and the state of our food system, meanwhile Casey was trying to stay dry while drooling over all the food. He was very particular about no cross-contamination with our gluten-free food, which made us very appreciative. 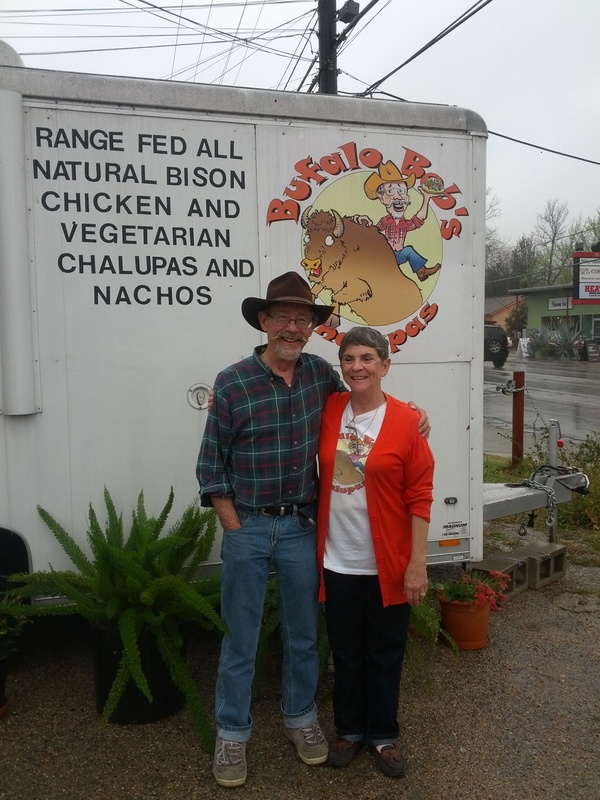 The menu consists of vegetarian offerings, along with natural chicken, and natural bison chalupas. 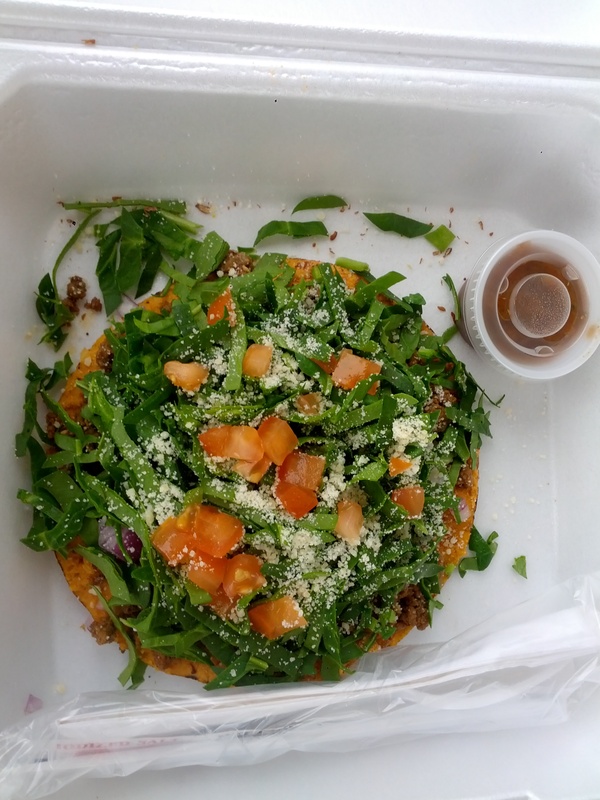 After mulling over the menu for some time, Casey and I both decided on the Cordoba chalupa, which has hummus, flax seeds, bison, spinach, tomato, and parmesan cheese. They were delicious and loaded with shredded spinach, which made this mama happy! Who would have thought to substitute shredded spinach for lettuce…genius? After bidding them goodbye, with the promise to return, we hurried to my car and scarfed down our provisions in the rain. Those chalupas definitely hit the spot and were a great way to start the trip. Our next stop was to the Salty Sow for dinner. Their tagline is Swine + Wine + Beer. It was a really cool atmosphere and Casey was super excited to try their French fries fried in duck lard. I admit I was excited, too, because I’d never heard of duck lard, and couldn’t wait to actually have some fries. Sadly, it turned out they were not gluten-free. Boo. Once the waiter came around and finally brought our menu back marked up with gluten-free safe items, we got down to decision-making. 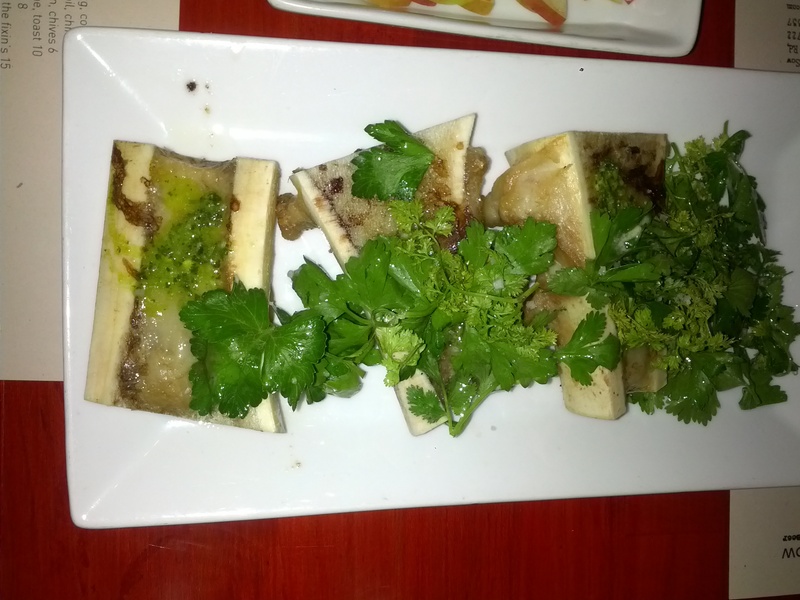 We started off with the Roasted Bone Marrow (Casey’s first time) and Truffled Deviled Eggs. 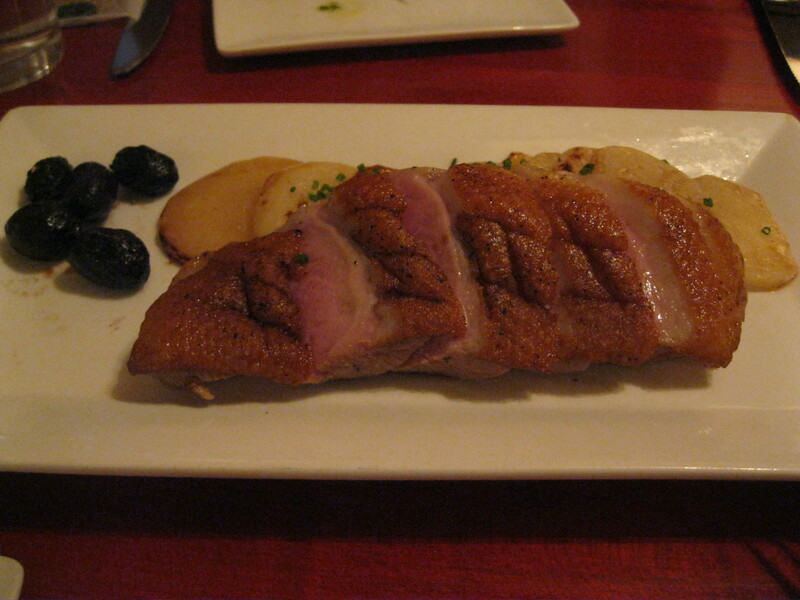 For the entrée, we split the Duck Breast with roasted turnips and added a side of mashed potatoes. Oh my word…I’m not sure if I was that hungry, but everything was divine! I just about licked the bowl of potatoes and nearly fainted at how tasty the turnips were. I think we both branched out that night and were pleasantly surprised. 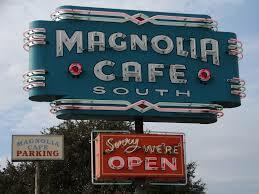 Magnolia Cafe was our late night trip after a failed attempt to get our groove on on 6th street. We were both shocked that with it being South by Southwest (SXSW) at how dead the party scene was. I guess we hit the college kids being gone on spring break, and apparently since it was the techie part of the festival, no one wanted to shake their booty. Sad times for sure. So, after bar hopping to probably 10 different places, we finally gave up. I convinced her to try Magnolias (in the hopes of getting the famous Mag mud, which is loaded queso) since it was one of those local dives that you just have to experience while visiting. After her talking me out of the queso, due to my NO DAIRY eating, we both ordered omelettes. I noticed that you could add some ground beef or bison to your omelette, so I had the waitress add some bison. 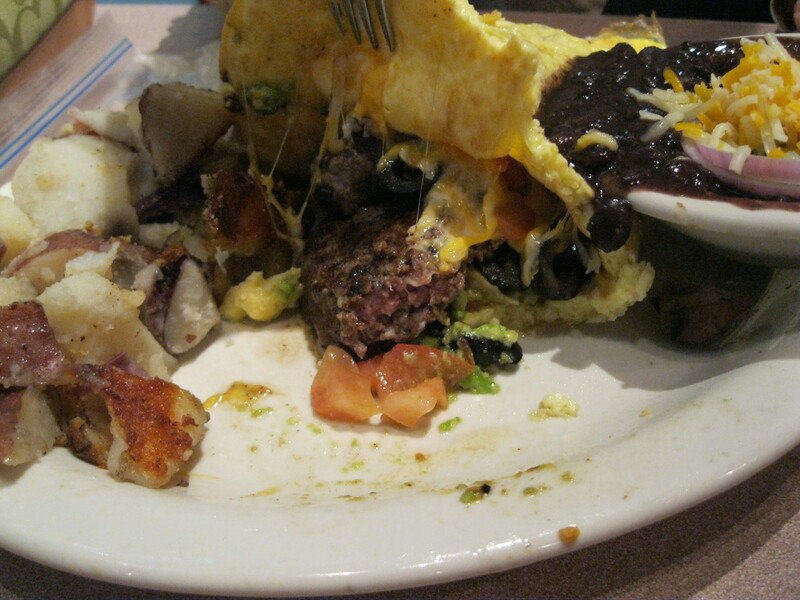 Um, little did I know that that meant adding an ENTIRE BISON BURGER INSIDE MY OMELETTE! Holy cannoli! I couldn’t believe that they shoved that whole thing in there…or the fact that I cleaned my plate. The burger was too juicy and delicious and I was not about to let it go to waste. It’s hard to tell in this pic, but it’s in there! After gorging ourselves on breakfast food, we wrapped up our late night meal and headed back to our house. I knew that was only a small taste of the amount of food we were about to consume the next day, and was excited to make an entire trip about food, knowing the weather would keep us mostly inside. 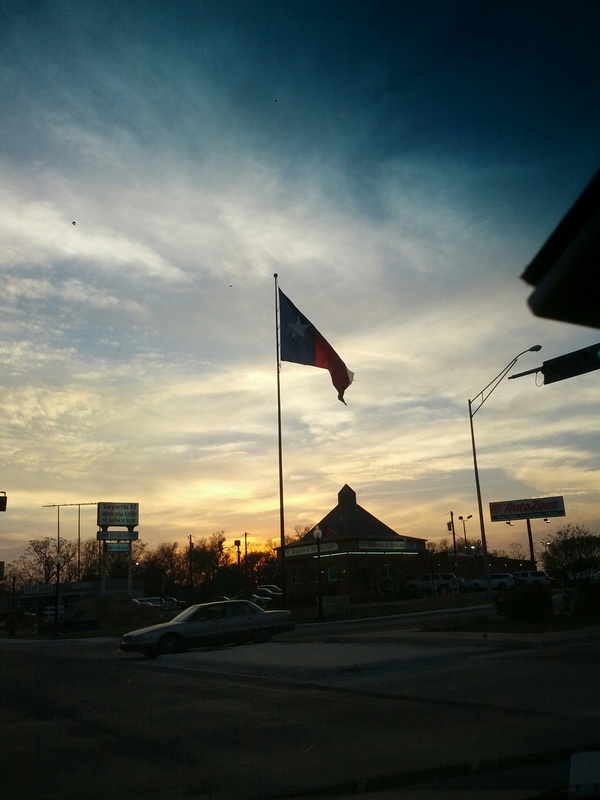 Next up is day 2 of our Austin adventure, so get ready for some more good eats from some delicious restaurants and local fare. We covered a lot of ground and food that day, so be prepared to feast your eyes and taste buds.